When was the last time you looked at how the Australian dollar is fairing on the market? May be on the rise, but according to foreign investors, it’s still pretty low. What does that mean to you and I? Everything. From lower currency exchange when travelling overseas to inflated prices on average items we buy, day to day. And the property market? You can bet that while the Aussie dollar is low, foreign investors will do anything to dig their hands into Australian soil. A lot of the newer developments are heavily marketed overseas with the desperation and push from developers to secure financial funding. The earlier they pay for their construction, the better in their eyes. And when you have foreign investors wanting to eagerly take advantage of lower prices, well, naturally the Australian property prices increase, sometimes and mostly beyond the means of the Australian people. Is a low Australian dollar the only contributing factor to unreasonably priced houses? No, but certainly a strong one. The question to you is - do you buy now or wait? Isn’t it nerve-racking?! Once upon a time in Australia, houses were bought and sold at the right prices. Indicative of that were factors like the state of the economy including dollar value, employment rates, salary and lifestyle expectations and more. While our average Australian income has increased somewhat, so too has the housing market and day to day expenses. But nothing seems to balance out. The cost of living in Australia seems to have outweighed our level of income, causing more and more credit card and other loan debts to meet the demands of our consumerism and lifestyle choices. From the latest smart technology and throw-away fashion to current car models with bluetooth, social media capabilities, gps and leather interiors, we are no longer satisfied with making the most of what we have. And we want more. But where does it end? Here’s the news. It won’t. So if you can’t afford the repayments of inner city living, have you considered moving a little further out? Like forty minutes away? A little inconvenient, yes. Especially when it comes to waking up 1-2 hours earlier in the morning to get the kids ready for school and you ready for work. Do you think you can manage it? Takes some getting used to. Don’t forget to factor in the traffic! But it could be do-able. If you’re on a single income (and let’s face it, divorce rates aren’t shrinking), can you manage the repayments on your own? If you’re on a dual income, then buying in an inflated market in the area you want that’s convenient to both partners and your kids school and after school activities is going to probably win. But you need to perhaps make a few alterations in the way you live. Are you willing to make changes in your lifestyle to live where you want? Can you borrow a little more to build a granny flat and make an extra income that can go straight to your offset account and reduce your home loan faster? Are you willing to sacrifice family time and take up an extra job to make ends meet? bake more and buy less - to live more comfortably? These are just some suggestions on curbing spending habits to make affording the house you want in the area you prefer a lot easier. It may not seem like much, but when you add up all the takeaway coffees, lunches and blowdrys together, you could be saving a good few thousand a year. Sure, the property market cycle, historically speaking can last 10 years or so, but is this what you rely on? Do you wait for the cycle to end before jumping on the bandwagon? What if you’re ready to buy now? Ten years is a long time to wait, particularly when you’ve worked hard at saving your deposit and are eager to invest it. After all, don’t be tempted to splurge your deposit on that world trip instead! You never know when you’ll be bitten by the spontaneous, ‘live-for-the-moment’ bug. will you be ready to repay a higher rate if the cash rate increases exorbitantly? These are factors we need to consider before purchasing a property, no matter what part of the cycle you happen to invest in. Furthermore, is there a risk in ‘waiting’ for prices to drop? Yes. Bottom line, because while you’re waiting, prices may just as well continue to go up. Sure enough there is a financial cycle that historically tells us the pattern in which the cost of various things in our lives are affected, but sometimes we just can’t sit around and wait. And if you do, well, that’s simply the risk you take. If you do have the time to properly study the direction of the market, then the above diagram is a good place to start. What does the diagram mean? Right at the top, "boom" on the diagram is the peak in the market, a time to sit back and wait if you can before making a purchase. Wait for prices to drop. This could be anything from a few months but likely to be a few years. During the peak/boom, it’s a popular time to sell your property if you’re planning on various things like relocating, reinvesting or retiring and downsizing. And there’ll be plenty of buyers too - usually because buyers that have put off their purchase, suddenly act a little rash and desperate, thinking that prices will continue to go up so they feel that they ought to purchase immediately before they miss out on buying where they want altogether. We’re actually witnessing this right now. Problem is, the price of houses don’t seem to reduce much at all. Time will tell. 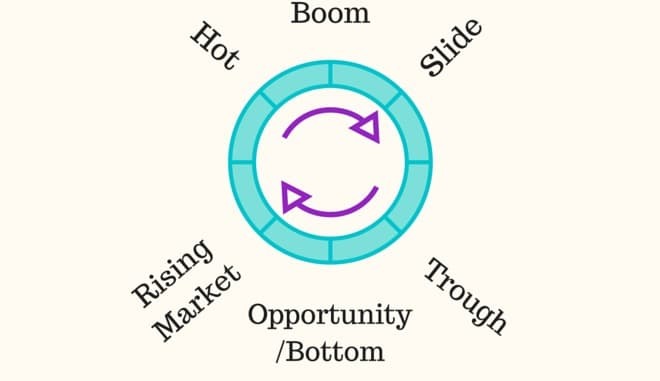 "Slide" or the slowdown position is where the market begins to drop and starts sliding down in value. Expect the prices to drop by 5-10% or so. This will give tentative buyers more confidence in making the plunge and buying. "Trough" is known as the ‘falling market’. Almost a landslide? But definitely a desperate time for sellers and buyers alike. Think of an imminent stock market crash. People buying and selling shares like crazy in case they miss out on the opportunity. Well it's the same for the housing market. Panic sets in and people become desperate to sell just in case prices plummet way too low. On the other spectrum there are super keen buyers, stocking up and buying second and third properties because they’ve been waiting for this opportunity for years, saving up their equity or cash deposits. Fear plays a massive part here. What we want to tell everyone is, if you can afford to hold onto your property, do! The best time to buy? According to finance experts, "rising market" is typical for novice investors, and "opportunity" for those who are more confident, having been watching the market over some time or have already dabbled and seen a familiar pattern in the market. If the market reaches "hot", should I buy? Completely up to you, but this is when more people than ever are stepping up and buying. From foreign investors, inter-state investors to locals! This is when the market has gone a little la-la, and the general public are even more desperate and full of fear while happy to pay more than the property’s worth. Hey, by all means, if you can afford the home loan for a house worth only $1.2million and you borrow $1.5 for it, then sure, go for it. If you can afford the repayments, what’s stopping you? But don’t expect to sell it any time soon. If you decide to sell it in a couple of years, chances are the house you just paid $1.5m for will only fetch $1.1m or less, and you’re stuck having to cover the shortfall on your overpriced mortgage. How will you do this? Be forced to sell an investment property? If you have your parents as guarantors, will you force them to sell the family home to cover your silly buying decisions? Are you prepared to go bankrupt? Borrowing money is not a game and we all need to get a little more serious about how we invest. We’re not saying to not buy property. But invest wisely. How do you translate this diagram into real life? You’ll need to chat to a financial advisor if you’re not sure where the market is at right now. They’ll have a pretty good insight to the existing cyclical patterns that we’re already in the middle of, and what to expect around the corner in the short and long term. Read more in our home loan hub.